If Half Man Half Biscuit did not exist, it would be imperative to invent them. Since their formation nearly 30 years ago, their presence has been a necessity. In essence the vehicle for the observations, ramblings and creations of frontman Nigel Blackwell, they are a counterblast to the processes of modern life. Throughout changing times they have spanned the decades, released 12 full-length albums and dropped a thousand-and-one pop culture references; from BBC Radio’s Charles Nove to former England cricketer Fred Titmus. Their approach to promoting their music is famously non-existent – a handful of UK gigs each year is normal. Even rarer are interviews of any kind. Blackwell himself states his biggest achievement, as “creating a situation for myself whereby I can get up of a morning and decide to go and tackle Bwlch Pen Barras on the bike, […] rather than report to a superior to await orders”. Their existence is somehow outside of the modern world, yet also a reaction to it. 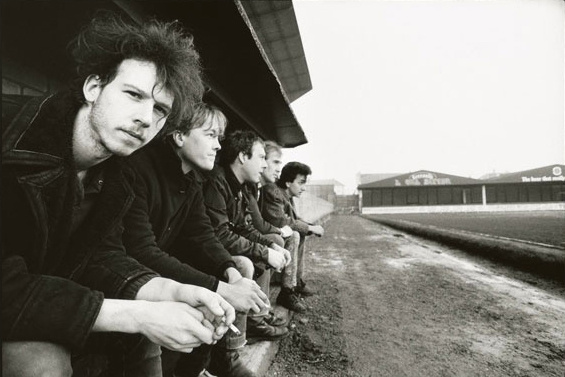 Merely by continuing to release and perform, Half Man Half Biscuit serve a greater purpose – to rally against the crap that life throws up with a wry smile, and also to take joy in life’s small and simple pleasures. There have always been lessons to be learned from Blackwell’s timeless wit and wisdom. Some remain relevant after all these years. For views on pedestrian etiquette, see ‘National Shite Day’ and ‘L’enfer C’est Les Autres’. For a creepily accurate character assassination of Jimmy Savile see ‘I Left My Heart In Papworth General’, released all the way back in 1985. A few pearls can be found in these 13 tracks, too. The stand-out line this time is the following from ‘This One’s For Now’: “The greatest surface under foot is springy turf / Why does the winner of Mr Universe always come from earth?”. There are too many challengers to mention many more. Going through their career in a box – incorrectly – labelled “comedy” has meant that HMHB have been often misunderstood and under-appreciated. There are, naturally, comedic elements but this is far from music for the sake of laughs and the humour is almost always dark. Satire is a strong word, but what they practice is, in a way, a satirical look at life – of the everyday, the mundane, mildly irritating and outright absurd. As much as I had loved the debut LP Back In The D.H.S.S. I wasn’t sure if the band were really up to it. I hadn’t seen or heard them play live and I feared they would be a tuneless shambles. And then one night they appeared on my TV screen via The Whistle Test on BBC2 where they performed tracks from their new EP. They were absolutely magnificent and my doubts were vanquished. This is perhaps the quintessential HMHB song. Trumpton, for those who might not know, was an imaginary town that featured in a children’s TV show animation from the late 60s. There had only been 13 episodes but they were on constant repeat and so they were ingrained in many a person’s pysche. But it took the genius of Nigel Blackwell to take the social disorder happening on the streets of the UK (and captured perfectly on Ghost Town by The Specials) and imagine it happening in Trumpton. I’ve gone for the Peel Session from 1986 as it is a bit more manic sounding than the EP version and is closer in tone and sound to that unforgettable Whistle Test performance. Twenty plus years on from the debut material and they still have the ability to make me laugh out loud with brilliant lyrics. New age mum has divorced ordinary bloke dad….but he will use the kids to get his revenge!! Not once…but twice!!!! And the closing line of the song….while having nothing to do with the rest of the lyric…is just observational comedy of the highest quality. The sacred gods of the indie congnoscenti are not immune from Nigel’s wit as evidenced from this very very funny and very very very sing-along tune from a 2005 album they had the wit to call Achtung Bono. David Gedge may be the author of the best break-up songs in the indie music canon but even he hasn’t come up with the sheer misery and heartache of this track from the Trumpton Riots EP. Six months after broken-hearted bloke has returned her brown anorak he is still suffering nightmares and on the edge of a psychotic breakdown from her failure to return his pin-up of the Russian goalkeeper that many football fans reckon was the world’s best ever. More children’s TV animation show inspired nonsense…. And I ride on the footplate, there and back again. An unreleased track that has only ever featured in a Peel Session back in 1995 and quite simply the best ever tribute to The Birthday Party that has been ever written and recorded. I wonder what Saint Nick made of it? Time to slow things down a little….and here’s some stand-up comedy, set to a folk tune, featuring the tale of someone turning up to buy things from the night-shift staff member at the filling station. We’ve all done it haven’t we??? Summing up in under 100 seconds everything that was and remains wrong with sports broadcasting in the UK. For the most part, ex-players do not make the best pundits. Cracking wee tune to boot. Most HMHB tracks are of the short and sharp variety, so this, the closing track from C.S.I. Ambleside which clocks in at almost six and a half minutes, has to be regarded as epic. It is an extended rant of what it is about modern society that pisses Nigel off set to a tune that thirty years ago you’d probably never imagined the band being capable of recording and playing. Class, pure class. Can’t really argue too much about your selections JC – I don’t envy you attempting to find just 10 – but I would have had to find space for ‘Restless Legs’ from Achtung Bono, the tragic love story that is ‘Tour Jacket With Detachable Sleeves’ from Some Call It Godcore, and ‘Tending The Wrong Grave For 26 Years’ from Saucy Haulage Ballads. Also, if I were to include one from their magnificent latest album, it would be either ‘Old Age Killed My Teenage Bride’, or ‘Westward Ho! – What A Let Down’, the latter track because Westward Ho! is a crap seaside town in North Devon which used to have the best live music venue in the area (The Anchor Inn). I spent many weekends in moshpits there! According to Wikipedia: “In December 2014, readers of The Guardian voted [Urge For Offal] the best album of the year, despite the fact that that newspaper had never reviewed or even mentioned it.” Power to the people, eh? Hmm, think I might have to compile a volume two….. It needs to be a double album. “Breaking News” should be in there – a tirade of the annoying stuff of modern life. And is there a better intro than “Dickie Davis Eyes”? Makes the hairs on the back of your neck stand on end. “Careful with that spliff, Eugene”. LOLOLOLOLOLOL!! So I downloaded each of these and then played them back to back and two things sprang to mind. 2. As a mixtape this seriously works. The only addition I’d make (and lawd only knows what I’d remove to put it in) is the Andy Kershaw session version of “Paintball’s Coming Home”…genius, with a cover version thrown in.